Shipyard & showroomProduction, history etc. ShowroomAs unique as the brand itself. 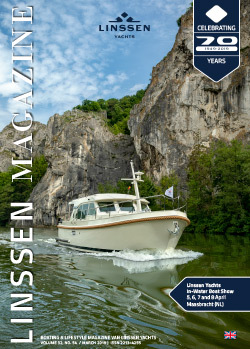 With our Linssen ownersOwners Clubs, blogs etc. Is that a Linssen 500 AC Variotop®? That’s a logical question if you see the new 450 AC Variotop® approaching in the distance. The similarity with our top model is striking, both inside and outside. The differences can be summed up as follows: 2.70 metres in the total length and only 2 metres in the hull length. That’s the biggest difference compared with the 500. There are, of course, differences between the new Linssen 450 AC Variotop® and the 500 AC Variotop®. But the DNA of both Grand Sturdy models is identical. We made a very deliberate choice to use the 500 as a basis when we started designing the 450. With a length of 13.75 metres and a width of 4.65 metres, the 450 is shorter and narrower. However, these are the perfect dimensions for applying our Variotop® concept. The 450 will be the smallest member of our Variotop® series and that will remain so in the future. When you hear the word ‘superyacht’, you immediately think of the large luxury yachts that can be admired in Monaco. But if we forget the huge dimensions and just look at the level of luxury, we have no hesitation in designating our 450 AC Variotop® as a ‘superyacht’. With a length of ‘only’ 13.75 metres, the 450 is an extremely flexible boat that is easy to handle. Just by yourself, without any crew. The length-width ratio of this latest Linssen is perfect for sailing on European inland waterways. It is a generally accepted size, so that you will be welcome in all marinas. Many boating enthusiasts and yacht owners have it high on their bucket list: ‘taking the shortcut’ from the Netherlands to the Mediterranean. And rightly so. It is a fantastic experience, particularly with a Linssen, to sail from north to south through a splendid system of canals and more than 225 locks. From the Meuse to the Canal de l’Est (Branche Nord), Canal de l’Est (Branche Sud), Petite Saône, Saône and Rhône. Thanks to its ideal dimensions, you can make this voyage with the new 450 comfortably and entirely stress-free. That is the big advantage of downsizing: your sailing area is extended. The 450 means living the high life in France, free and without a care. What is there more to tell about our patented in-house developed Variotop® concept? In the luxury pleasure craft market up to 16 metres, there had been nothing to compare with it for more than twenty-five years. The introduction of our Grand Sturdy 450 AC Variotop® means that this one-touch folding roof is also available to anyone who is satisfied with a yacht of 13.75 metres. We at Linssen were thinking long ago that uniting the interior and exterior helmsman’s position at a single location would yield a huge amount of space. We found this central location on deck. By creating the Variotop® wheelhouse concept, we opened up the world to boating enthusiasts, both literally and metaphorically. The Variotop® that we are now fitting to the 450 is undoubtedly the best Variotop® that we have created in our 70-year history. The Variotop®, isn’t that a sort of sliding roof? Not really. In the case of our 45.0 Sedan, you can opt for an electric sliding roof. It’s great to allow fresh air into your interior, but it cannot be compared with the Variotop®. That is because the Variotop® can be opened and folded back completely, which creates a huge outdoor space on the aft deck. And all this happens at the touch of a button. Within a few seconds you are standing in the open air steering your 450 from a flybridge. If you close the Variotop®, you are creating extra space inside with a lot of privacy. The perfect spot for a good book and/or a decent glass of wine. It’s hardly surprising that the Variotop® wheelhouse includes the word ‘house’. It is a high-quality finished space that has everything you need. An elegant helmsman’s position with all the required instruments. A helmsman’s bench for two persons that can be adjusted electrically in height and depth. A compact wet bar with a washbasin and fridge and extra benches for your passengers. At this location on deck you can experience the great outdoors. Variotop® open, helmsman’s bench raised, head in the wind and enjoy. Even on a late autumn day, you can still enjoy the final rays of the sun with the doors closed and the central heating on. 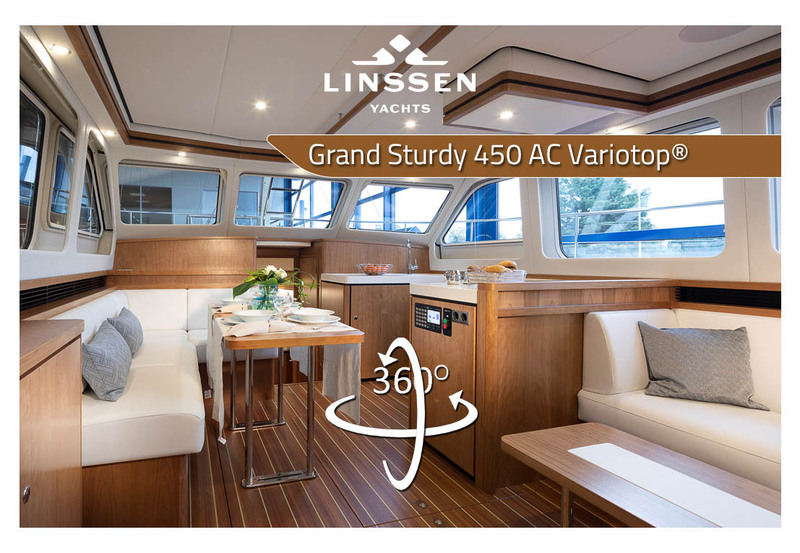 If you examine the artist’s impressions carefully, you will discover a difference on deck with the Linssen 500 AC Variotop®. The 500 has two off-centre steps on the aft of the yacht, while the 450 – just like the 40.0 AC and 45.0 AC – is equipped with Centre Line Traffic. Or to put it another way, a single and comfortable passageway to gain the maximum space from the slightly shorter aft deck. ’Nothing is left to be desired regarding the standard features’, is what we wrote in the introduction to the Grand Sturdy 500 AC Variotop® in November 2017. We can now repeat those words without hesitation when introducing the 450 AC Variotop®. The styling, equipment, choice of materials and finishing are all of Linssen level. As is customary and just as you would expect. Normally speaking, copying is out of the question at Linssen, but in this case we have duplicated some of the aspects of our Linssen 500. That is exceptional and unusual if you go from a 15-metre yacht to a 13-metre yacht. But at Linssen, we make no concessions when it comes to quality. You can see that in the saloon with the saloon bench and table, in the spacious galley with all equipment you will need and in the L-dinette with functional dining table for breakfast, lunch or dinner. If there’s one characteristic of the 450 AC Variotop® that stands out, it is the spacious guestroom that has been created in the forward compartment. You seldom see such space on a yacht of this size. In this case too, we closely examined the design of our 500 AC Variotop®. Consequently, the 450 is an extremely pleasant boat for sailing with guests for a short or longer period. This latest Linssen offers a great deal of comfort to two couples or parents with children. The guestroom includes a large double bed surrounded by a lot of storage space, a separate shower and a separate toilet space. All this is completely divided off from the other compartments, so that privacy is guaranteed. The master state bedroom for the captain-owner is located in the aft cabin. These even more spacious sleeping quarters include a broad double bed. The master state bedroom has access to your own wet room with electric toilet, washbasin and shower. Here too there is plenty of cupboard space and, as the icing on the cake, a lounge/office corner for two people. The passageway from the aft cabin to the saloon contains even more storage space. This is also the ideal place to fit extras such as a second fridge. There are also many parallels between the 450 and the 500 under water and ‘under the bonnet’. For instance, the engine room (including two Volvo Penta engines) and the low-noise propulsion concept are identical and the green LIPPCON® (Linssen Integrated Propulsion and Power Configuration) system ensures the power management on board by means of smart energy management and a low-noise generator. This means you can use the bow and stern thruster freely and navigate the narrowest passages without problem on your 450 AC Variotop®. The Softchine Prestressed Hull (SPH®) hull shape that we developed for the 500 is also the hull shape for the 450. This new hull construction forms the basis for the excellent sailing characteristics. During sailing you feel less resistance, you hear less noise and you use less fuel. In our privacy statement we explain what information we collect on our website and how we use them.